Ah, summer. For those with AC, it’s a wonderful season full of outdoor (and indoor!) fun; for those without, it can be miserable and even dangerous. Homeowners in the market for a new central air conditioner will be pleased to know that today’s central air conditioning units are far more efficient than models even just 10 years old. Here’s a guide to choosing the right central air conditioning unit for your house’s needs. Conventional Central Air Conditioning Units: A conventional air conditioner system works by drawing hot, humid air into return ductwork, cooling and dehumidifying it and returning it into the room. The newly cooled and dehumidified air is much more comfortable. Central air conditioning units can be split, meaning there is a condenser/compressor unit outside and an evaporator unit inside, usually mounted on the furnace or an air handler. Units can also come packaged, where the compressor and evaporator are in a single unit is outside. If you are planning to retrofit an existing home with central air, a conventional system can use the house’s established duct work if the heat is forced air. If your home doesn’t have ductwork, it will need to be installed in the attic, basement or crawlspace. This drives up the cost, making installation sometimes out of reach. Ductless Central Air Conditioning Units: In this case, homeowners might consider a ductless system, sometimes referred to as a mini-split system. It works using an outdoor compressor that serves individual units that contain an evaporator and blower fan. These are usually placed on the top half of a room's exterior walls. Units are large, but relatively unobtrusive. It is often more expensive than a conventional unit, but homeowners can save a lot of money by not having to have their homes fitted with ductwork. As opposed to window units, a ductless system is quieter, doesn’t block your view and will also heat the home. After you select a type of central air conditioning unit, you’ll need to determine what size and what level of efficiency is needed to best serve your needs and stay within your budget. Size: Get a central air unit that is too big, and your house will be damp and cold and it will cycle on and off too much. If it is too small, it will not be able to keep up and could freeze. A lot goes into determining the size of the air conditioning unit: size of the home, number of stories, insulation, number and quality of the windows, amount of direct sunlight and even the amount of shade your home gets. Collectively, this is called a cooling load analysis. The HVAC technician who you work with will do this for you, but you can go to www.northernac.com to get a general idea of what you will need. 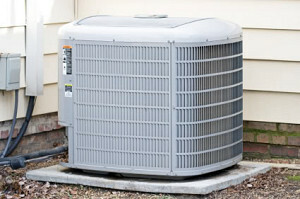 Efficiency: Today’s low-efficiency units are as good as high-efficiency central air units made just 10 to 12 years ago. With the price of energy skyrocketing, it’s a great time to replace an old unit. You could save 30 to 50 percent on cooling costs and reduce your home’s environmental footprint. Central air conditioning units have a Seasonal Energy Efficiency Ratio (SEER) making it easy for consumers to know how efficient a system is. The higher the number, the more efficient the unit. The standard number is 13. Filter: If you have a family member who suffers from allergies or asthma, air quality is important. Look for an AC unit with a high Minimum Efficiency Reporting Value (MERV). A rating of 8 is standard. Noise: If quiet is important, look for a unit with a Scroll compressor. Price: You can expect to pay a lot for central air conditioning. According to CostHelper.com, the price can be anywhere from $3,500 -$7,000, depending on a variety of factors, including the size of your home, what needs to be done and the efficiency of the model you choose. If you need ductwork installed, it can run $8,000-$10,000 or more. Choosing an air conditioning unit that will work most efficiently in your home is important. A professional installer - or a manufacturer representative, if you plan to do it yourself - can help you determine which unit is best.